Autoimmune diseases are sometimes associated with immune-mediated renal diseases and cryoglobulinemia is one of the causes. Cryoglobulinemia and cryoglobulinemic glomerulonephritis associated with primary Sjögren’s syndrome are most frequent condition among non-hepatitis C virus-related condition. Its typical renal manifestation shows high amount of proteinuria with microscopic hematuria and renal insufficiency. We describe a case of 72-year-old woman with Hashimoto disease, autoimmune hepatitis, Sjögren’s syndrome, and immune-related pancytopenia complicated by cryoglobulinemic glomerulonephritis. Before kidney biopsy, tubulointerstitial nephritis probably due to Sjögren’s syndrome was suspected because of persistent hematuria without significant proteinuria and developing mild renal dysfunction over 6 months. 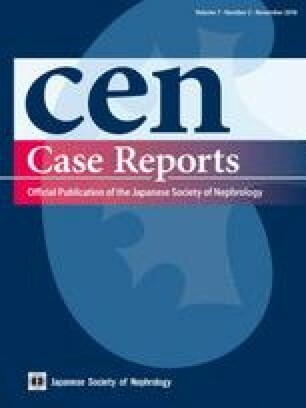 The developing renal dysfunction associated with isolated hematuria is uncommon in glomerular diseases. Kidney biopsy, however, revealed established membranoproliferative glomerulonephritis with subendothelial deposits consisting of tubular structures with IgM, IgG, and C3 staining. Corticosteroids plus mycophenolate mofetil therapy successfully normalized renal function. Physician should not overlook cryoglobulinemic glomerulonephritis, which is potentially poor prognosis, even if urinalysis shows only persistent isolated hematuria in patients with autoimmune diseases. We would like to thank Ms. Hiromi Yamaguchi for her technical assistance.